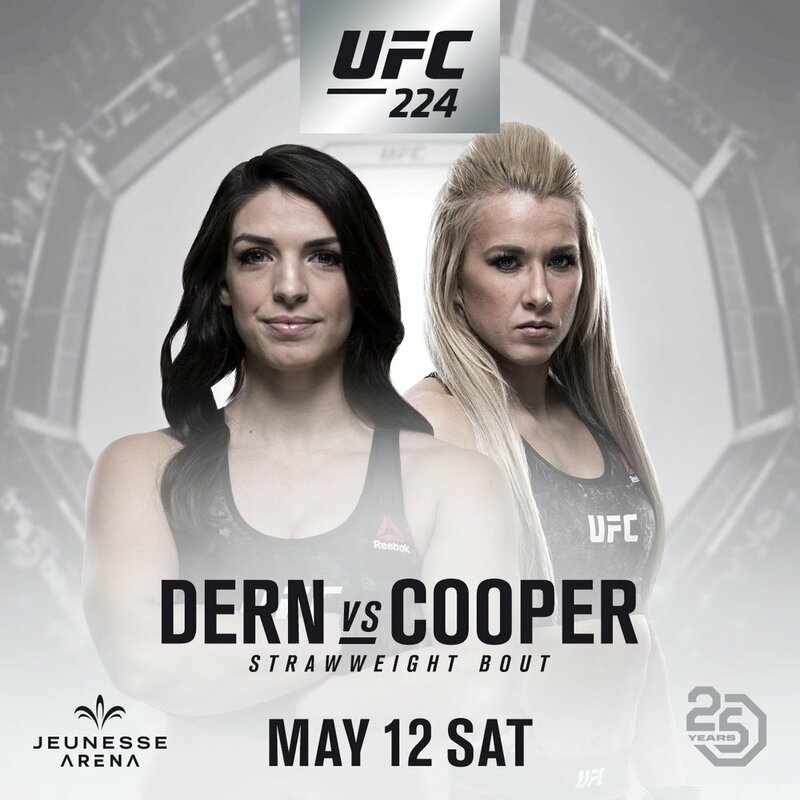 Don't miss two great ladies fights tomorrow night at UFC 225 taking place at the United Center in Chicago. First up catch Claudia "Claudinha" Gadelha (15-3) and Carla "Cookie Monster" Esparza (14-4) on the Fox Sports 1 preliminaries starting at 7 PM CT. 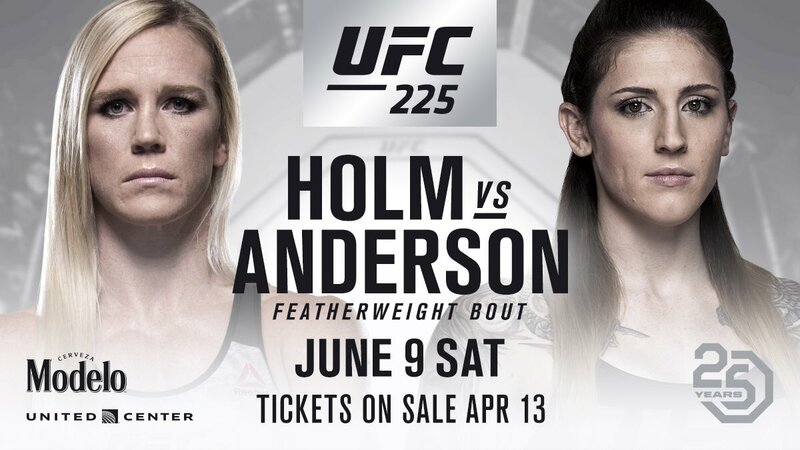 The on the PPV main card starting at 9 PM CT Holly "The Preachers Daughter" Holm (11-4) will welcome Megan Anderson (8-2) to the Octagon. Good luck ladies! 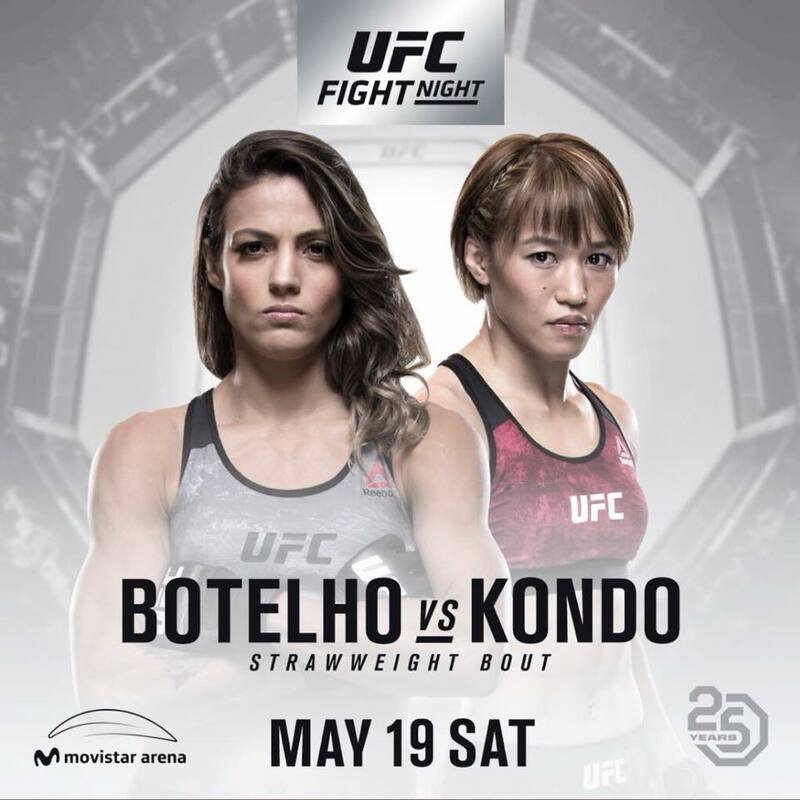 Don't miss three great ladies fights tonight at UFC Fight Night 129 taking place at the Movistar Arena in Santiago, Chile. First up on the Fox Sports 2 preliminaries starting at 8 PM ET, Poliana Botelho (5-1) will take on Syuri Kondo (6-0) in a strawweight match-up. 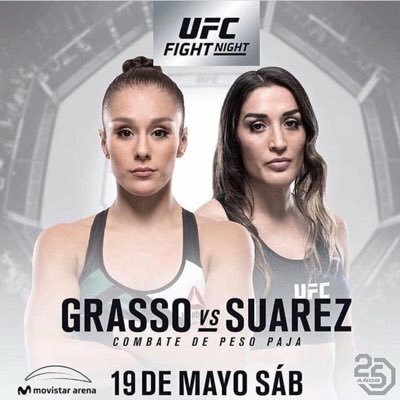 Next up on the Fox Sports 1 main card starting at 10 PM ET, Veronica Macedo (5-1-1) and Andrea "KGB" Lee (8-2) will scrap at flyweight followed by a strawweight battle between Alexa Grasso (10-1) and Tatiana Suarez (6-0). Good luck ladies! Don't miss two great ladies fights at UFC 224 tonight! 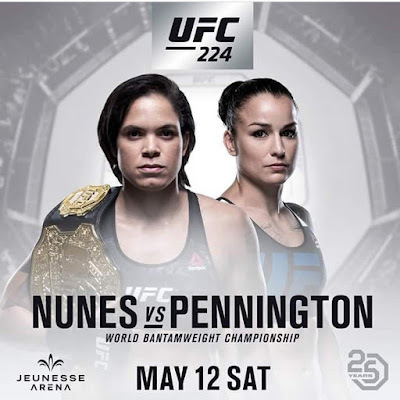 Taking place at the Jeunesse Arena in Rio de Janeiro, Brazil, the PPV main card starts at 10 PM ET. First up Mackenzie Dern (6-0) will take on Amanda "ABC" Cooper (4-3) and then in the main event Amanda "The Lioness" Nunes (15-4) will defend her bantamweight title against Raquel "Rocky" Pennington (9-6). Good luck ladies! 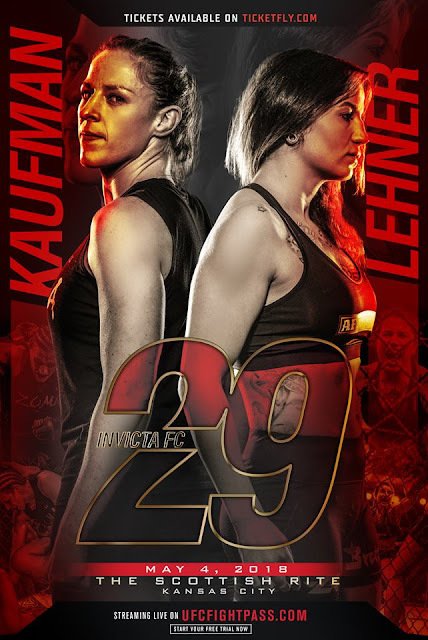 Invicta FC 29 returns to the Scottish Rite Temple in Kansas City, Missouri tonight! Tickets are available via Ticketfly or you can watch all the action live on UFC Fight Pass starting at 7 PM CT. Check out the full fight card listed below and send a shout out to your favorite fighters via Twitter by clicking on their names. Don't miss the rematch between Andy "The CrAsian" Nguyen (5-6) and Cassie "The Hulk" Robb (2-8) tonight at King of the Cage: Under Siege. 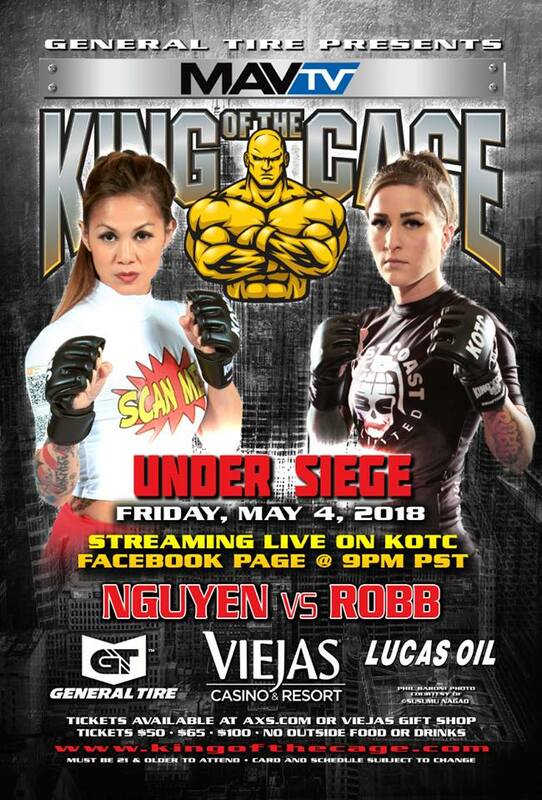 Will Nguyen pick up another victory or will Robb even the score? Catch all the action live from the Viejas Casino and Resort in Alpine, California starting at 7:30 PM PT. This event will be broadcast in over 50 million U.S. households on MAVTV (214 DIRECTV, 810 Verizon FiOS). Check your local cable provider for a cable station in your area. To purchase tickets, please visit Ticketmaster. 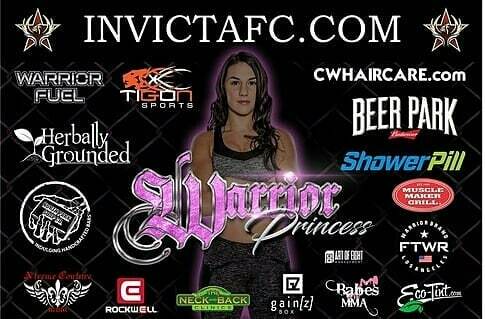 Babes of MMA sponsored fighter Cheyanne "The Warrior Princess" Vlismas (1-0) makes her Invicta FC debut against Helen Peralta (1-0) tomorrow night! Invicta FC 29 takes place at the historic Scottish Rite Temple in Kansas City, Missouri on Friday, May 4th starting at 7 PM CT and streaming live on UFC Fight Pass. For more on Cheyanne, give her a follow and shout out on Facebook, Instagram and Twitter. Photos courtesy of Cheyanne and Invicta FC.